Welcome to badge.team wiki for all info on badge.team compatible badges :). Badge.team is a project with the aim of providing a reliable off-the-shelf firmware for electronic event badges, with easy creation of MicroPython badge apps known as eggs and their deployment to end users through an app store known as the hatchery. It has its roots in the team responsible for the successful badge at the SHA2017 hacker camp in the Netherlands. Currently (Q1 2019) the badge.team firmware supports ESP32 platforms, and the team have produced firmware for three event badges with another in development. 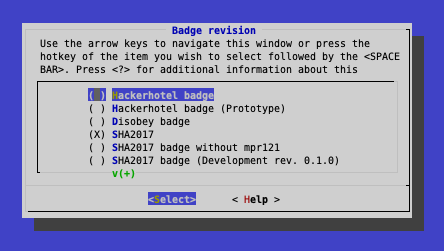 We also have a reference for the badge-specific MicroPython functions on your badge.